I have had the opportunity to meet some amazing bloggers through Taste As You Go, some in person and some virtually via Google Reader and Twitter. In an attempt to introduce my readers to some bloggers they may not know about and to highlight the writing skills of some incredibly talented people, I will be featuring Guest Posts on Taste As You Go from time to time. Today's Guest Post was written by The Veggie Queen™, Jill Nussinow, MS, RD, who is described on her website as "a vegetable and plant-food cooking expert in vegetarian, vegan, and gluten-free eating. Since I haven't devoted too much time to thinking about whether my own recipes are friendly to those with restricted diets, I was thrilled when Jill offered to write a Guest Post for Taste As You Go. When you're finished reading Jill's Guest Post, you should check out her blog, Veggie Queen Adventures. Thanks for writing, Jill! 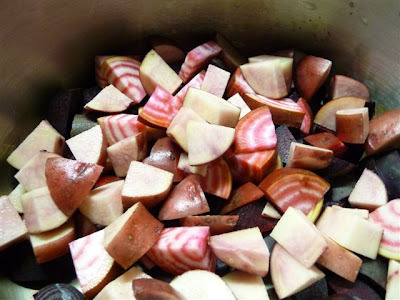 I love the earthy sweetness of beets and ditto for potatoes. Luckily, they are both in season concurrently. I am a potato fiend, buying more than I can eat at one time. I knew that my larder held pink-fleshed Red Thumb potatoes, as well as All Blues and others, to add color to this dish. Since I am a bit of a pressure cooking nut and have successfully cooked both beets and potatoes in the pressure cooker, I figured that I could make short work of cooking on a 90+-degree day. Generally, I cook both beets and potatoes for 3 minutes at pressure, leading to a "quick pressure release," easily accomplished with a modern pressure cooker (or requiring a trip to the sink with an older model). This time, at 3 minutes, the vegetables were a bit too al dente for me and needed another minute at pressure to be properly cooked. When they were, I removed them to a bowl and then added the fresh ingredients. I would have followed the recipe exactly, but instead, I heeded my motto: "Don't use what you don't have." I didn't have any sour cream or yogurt, vegan or not. However, I had a container of my vegan Garlic Herb Aioli in the refrigerator and I used that mixed with some vinegar instead of the blended tofu mixture. 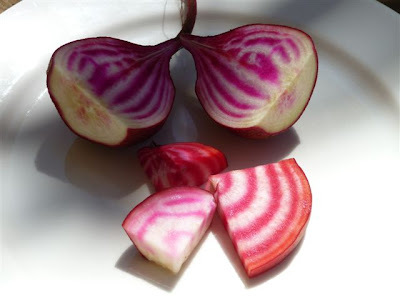 I loved the final product, but while Chioggia beets are incredibly beautiful when raw, their vibrancy fades with cooking (even though the pressure cooker actually helps retain more color and nutrients). Combined with the colored potatoes, the dish looked a bit unusual. At least whe using red beets, people can see that there are beets in the dish. This unlabeled potluck dish was shunned for more familiar, but far more boring and less flavorful, fare. I was incredibly grateful for that, though, as the leftover salad became part of a delicious lunch the next day. It was just how I like it -- the biggest beneift of using one of my own recipes. Steam the potatoes over boiling water until they are tender, 10 to 12 minutes. Drain and cool. Cook the beets, until they are tender, about 12 to 15 minutes, in enough boiling water to just cover them. Drain, cool and slip off the skin. Cut the beets into 1-inch cubes. 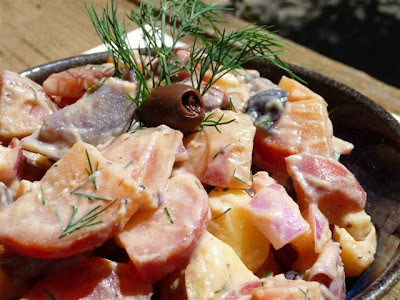 Gently combine the potatoes and beets in a large bowl, along with the salt, onion, dill and olives. Slice the beets and cut into 1-2 inch pieces. Do the same with the potatoes. Put them into the pressure cooker with ½ cup water. Bring to pressure and cook for 3 minutes. Quick release the pressure, and carefully remove the lid, tilting it away from you. If the vegetables are not quite cooked, lock the lid on and cook 1 more minute or until a knife is easily inserted into the beets and potatoes. You do not need to peel the beets unless they are very tough-skinned. Cut the beets as described above and continue following the rest of the recipe. Place all ingredients in a blender and puree. Add more water if it seems too thick. Stores up to a week in the refrigerator.